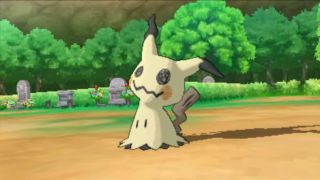 Good news if you're getting tired of catching all those 20-year-old monsters in Pokemon Go: Pokemon Sun and Moon will have a bizarre bounty of new creatures to capture. You've already met the creepy Pikachu cosplayer and the loving bear that doesn't know its own strength, now check their four friends out in this new trailer. Aside from Mimikyu, my favorite of the bunch is definitely Bounsweet. Apparently the Fruit Pokemon's aroma "has a calming effect on humans", so people let them live in their homes like cheerful little air fresheners. Sounds like a big improvement over spraying down your apartment with Febreeze every time outsiders come over to visit. You can browse the official Pokemon site to pick your favorite eau de Pokemon. Pokemon Sun and Moon will arrive on Nintendo 3DS on November 18, 2016. If Pokemon Go adds new Pokemon at similar intervals as the main series, you can look forward to catching a Wimpod in your bathtub sometime in 2038.